$15.50 $11.85 You save: 3.65 ! 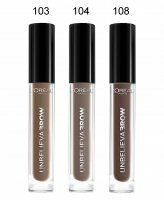 UNBELIEVA-BROW Longwear Brow Gel by L'Oréal. Eyebrow gel. It allows you to obtain a perfect eyebrow make-up, lasting up to 48 hours after application. This is the first product on the market, which, along with a long-lasting and water-resistant formula, also provides incredibly good pigmentation and delicate, non-irritating ingredients. The product consists of two elements: an applicator with a brush and an oblique brush, and a coloring gel with a sponge applicator. Thanks to them, eyebrows will acquire density, color and shape, and at the same time will gives natural finish. It can be used by both professionals and people just starting their adventure with make-up, because the product does not leave streaks and can be easily applied. The cosmetic is available in three colors, so that every woman can choose the right shade for herself. Perfectly thicken and gives color. Thanks to the water resistant formula it lasts up to 2 days after application. After applying, the eyebrows look natural without any streaks or stains. - 108 DARK BRUNETTE - dark brown. With the sponge aplicator, apply the eyebrow gel, filling all clearances and giving them a color. Using a oblique brush, set the borders of the eyebrows and give them the desired shape. Brush your eyebrows, making them smooth. And it's ready!